The point of Puddle is to guide a pile of liquid through a 2D side-scrolling obstacle course by tilting it one way or the other. However, you can’t adjust how far you tilt. If you tilt left, that’s it; you can’t tilt slightly to the left or way over to the left. So, without the ability to fine tune the angle you tilt the environment, there’s little point in the motion controls offered. I ended up mapping Puddle’s tilting controls to the shoulder buttons of my Wii U gamepad. But the lack of motion control didn’t mean the experience wasn’t tactile; I still got the feeling that I was juggling a sloshy piece of matter. Pictured above: a blue sloshy piece of matter. Because you can only move your water by tilting the environment, your control over the puddle is indirect. As a result, much of my time in Puddle was spent watching liquids careen out of my control. After all, an object in motion tends to stay in motion. If I let water race forward, I wouldn’t be able to stop it before it met some hazard. The joke, as you can imagine, is that sometimes I needed my water to move quickly, whether to cross a gap, climb a steep ramp, or for some other purpose. In short, Puddle gave me a feel for water’s momentum, regardless of the controls. Plus, without being able to finely adjust the tilt of the environment, I needed to take greater care in how I moved water. And the level structure helped me along in the process of learning how water moved. While no two levels are identical in construction, they often use similar basic elements, such as ramps and gaps. 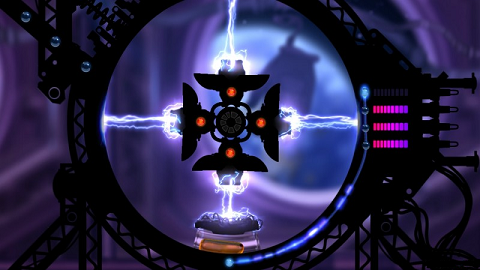 By the end of the game, when things get really sophisticated, you’ll carry water through windmill-shaped structures. Consider that the vast majority of your “enemies” are stationary hazards that zap away any of your water that touches it, and you can see that Puddle doesn’t get very complicated. 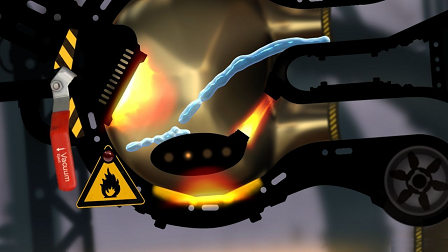 During this boss stage, you have to avoid frying the orange stuff with your own electricity. There is a caveat, though, since boss levels love new things. These levels introduce one-time mechanics which I often never saw again. In one, I tilted the screen to aim an electrical beam at a door lock, and in another, I had to guide a cart carrying lava along a track. Anyway, variety largely comes from the liquids you handle. The first liquid is water, as it’s the most straightforward, but you’ll go on to work with a number of others by the game’s end. Careful with the lava, since it dries up and moves slowly if you let it cool down. The radioactive solution, on the other hand, has extreme momentum and is hard to stop once you get it going. So, levels are conservative with new elements, and that helped me learn new liquids, but levels also took on reliable structures. See, each level has a few “verses” to it. By verse, I mean a sequence of challenges (jumps, hazards, whatever) culminating in the hardest challenge. Although Puddle stages have no checkpoints, verses were small and easy to memorize, and stages rarely went beyond four verses. Plus, I only had two buttons—tilt left and tilt right—so, if worst came to worst, I just memorized when to hit ZR and when to hit ZL. With this, I was able to conquer even the boss levels through sheer memorization. But memorization was a last resort with Puddle. Sure, sometimes I might have had to observe a gap’s location and try to anticipate it on a later run, but my experience was overwhelmingly characterized by just shifting water around. The levels were short and basic enough that they encouraged in me a sense of play; I got to experiment with how a bunch of liquids move, and the levels were testing grounds for doing so. 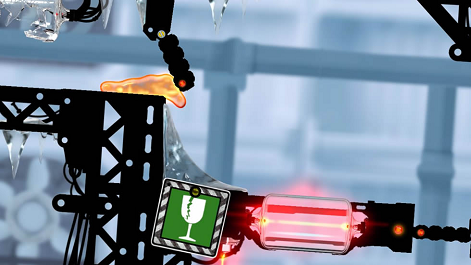 Puddle sticks to its concept admirably, just letting the player experience and experiment with a variety of liquids. However, I never got the sense that anything determined the order of levels aside from difficulty. That said, liquids within a given world (each world is 6 levels long) are always relevant to each other, playing off of similar gameplay ideas. Value Verdict:Purchased new in 2013 for $7.99. One run through took me a few hours, but perfecting my runs and earning high scores in this one took some time. It’s hardly the deepest and most rewarding set of mechanics out there, but it’s something to play with.